When I started the project 20lines a friend told me that I should have used a framework to build it, my reply at the time was that “I wanted to have control over everything”. With hindsight I can say that he was right, if you don’t have any particular technologic reason, it’s always better to rely on a consolidated framework, it would have saved me a lot of time, (thanks anyway Luca). On the other hand, in my opinion using a framework remove a lot of fun, and since with this website I just want to have fun, I’ll try to use them as little as possible. Obviously this website is not a big project but I’d like to develop it as it will be. 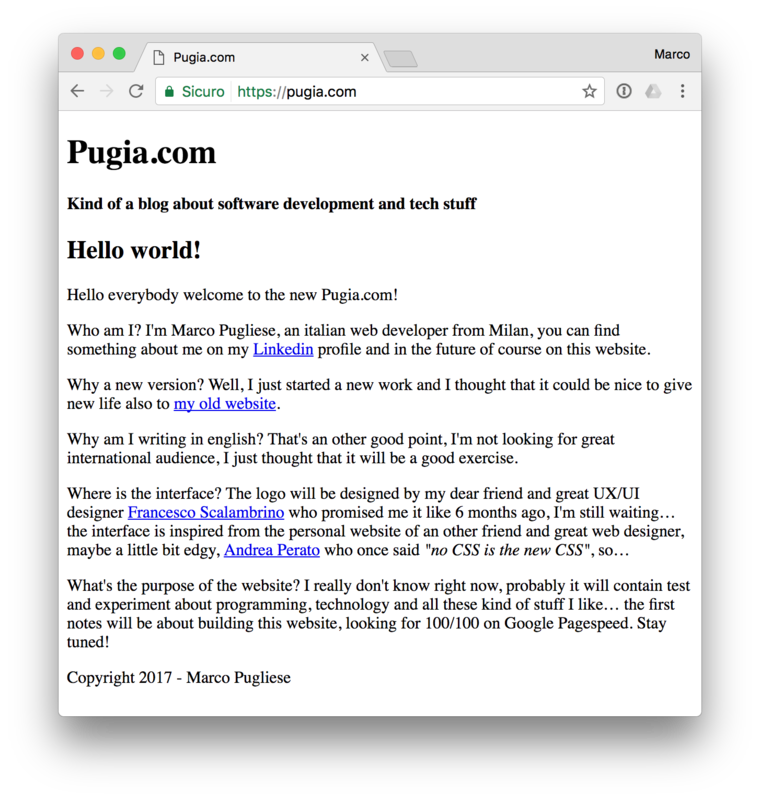 Since three years Pugia.com is no more hosted on a classic hosting service, it was on the smallest instance possible of AWS EC2. Last time I logged in the console I saw this new service from Amazon called Lighsail that basically simplify the deploy of virtual machines. Since the first year is free I decided to give it a try. The first test you can do on a website is the PageSpeed test by Google, it analyze the page and give you a score from 0 to 100. I want to keep my site as close as possible to the 100/100.